Ms. Barbara's blog and the Weekly Readalouds page of this website. The Pennekamp Library serves the students, teachers, and families of Aurelia Pennekamp Elementary School. All students visit the library every week to hear a story, check out books, and develop information literacy skills. 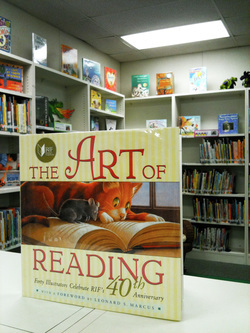 The library's collection consists of over 19,000 items, including fiction, nonfiction, reference materials, picture books, and books for emergent readers. Barbara Siegemund-Broka, library media specialist, staffs the library, assisted by a team of trained volunteers. The Pennekamp Library is generously supported by funding from the Manhattan Beach Education Foundation, the Pennekamp PTA, the Rotary Club of Manhattan Beach, and the Manhattan Beach Historical Society. The Pennekamp Library is open every school day from 7:45 a.m. to 3:30 p.m. One Wednesday each month the library closes at 1:30 p.m. due to district meetings. The library is not open during the summer or on school holidays. Pennekamp students accompanied by a parent or guardian may visit the library during open hours unless the library is in use for a class visit or meeting. Students accompanied by an adult can use the library after school for homework or reading. Students in grades 4 and 5 are permitted to visit the library during the lunch recess. Students and parents are urged to be considerate to other patrons when in the library. The library is a friendly place where conversation is welcome; but if students are trying to read or study, please keep conversation volume to a minimum. Cell phone use is prohibited. The number of books a Pennekamp student may check out at one time is determined by his or her grade level: kindergartners and 1st graders may check out 1 book; 2nd graders, 2 books; 3rd graders, 3 books; 4th graders, 4 books; 5th graders, 5 books. Pennekamp parents may check out 10 books at a time. The loan period for a book is 1 week. A book may be renewed 3 times, for a total loan period of 4 weeks. After that, the book must be returned. There is no overdue fine, but a student will not receive his or her year-end report card until any library issues have been resolved. Students or parents who lose or destroy a book must pay for its replacement. Payment may be made in exact change or a check to MBUSD.